Trustpilot is the world’s most powerful review platform, helping your business collect and easily manage customer reviews. Trustpilot gives people a place to share and discover reviews of businesses, while giving every business the tools to turn consumer feedback into business results. Your business may already be one of the hundreds of thousands of companies with reviews on Trustpilot. Check for yourself on www.business.trustpilot.com. SaleCycle partnered with Trustpilot to enable users to showcase trust in their brands at every point in the customer journey. Display the high ratings and positive reviews you receive on Trustpilot directly in your email campaigns. 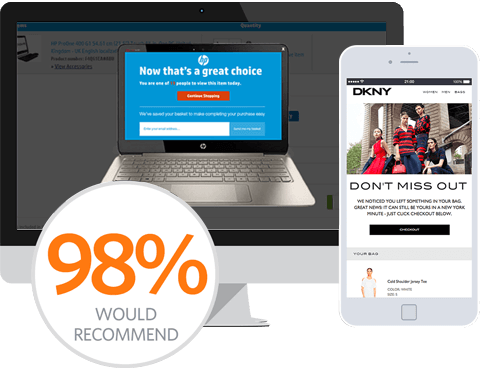 SaleCycle will dynamically display your TrustScore in email campaigns along with recent positive reviews. Recent reviews from real customers and a high TrustScore power brands to show their trust at every point in the customer journey. Use your most loyal customers’ experiences to engage and sell to new customers. Together, SaleCycle and Trustpilot ensure remarketing campaigns can have the maximum impact for mutual clients.